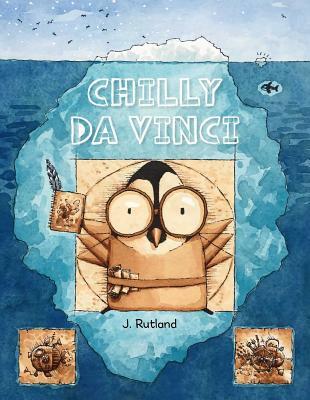 J. Rutland (Jarrett Rutland) writes and illustrates picture books and graphic novels. He's always felt pulled toward sequential storytelling. As early as kindergarten he was using free time to write illustrated books about vampires with his best friend. And in college, his thesis was a series of comic panels. These days vampires don't fascinate him as much as goofy mash-ups. This is his third picture book. He’s currently working on a graphic novel about his grandfather and another one about robot samurai penguins. He lives with his wife, son, and black dog in Asheville, North Carolina. Learn more at https://www.patreon.com/escapistcomix. Action-packed panels, diagrams of Chilly's inventions (and daydreams), and nods to Leonardo da Vinci make this a goodhearted embrace of trial and error and a celebration of failure as a learning experience. Rutland's energetic illustrations, peppered with side comments from background characters, add plenty of personality. A young Renaissance penguin triumphs after much trial and considerable error. A lively addition to makerspace collections that’s sure to inspire and nurture a spirit of invention.